Competing in his first full-time season of NASCAR competition, 2012 was an interesting year for Cale Gale. After making a splash in NASCAR’s top-three divisions in the late 2000’s, Gale had stepped away from the driver’s seat before coming back into the spotlight following a nearly four-year hiatus. In March of that season, Gale embarked on a trip to his hometown for Mobile, Ala., for the inaugural ARCA Racing Series event at Mobile International Speedway. 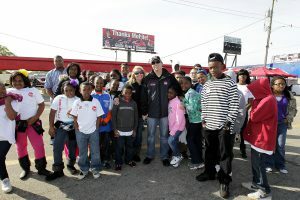 The event had two primary goals: 1) allow the driver to gain additional seat time and bond with his race team, and 2) gain additional media exposure for his primary sponsor, Rheem. The off-market stand-alone ARCA Racing Series event wasn’t expected to have a huge media turnout for national motorsports media. Likewise, fans and media were not overly educated on who Cale Gale was and/or his racing background, aside from his abbreviated NASCAR schedules in years past. That being said, getting national media to turn out to an event that they wouldn’t typically cover for a driver that they weren’t overly familiar with, was an uphill battle. We crafted a publicity campaign entitled the “Cale Gale: I Love Mobile Hometown Tour” that was designed to both gain recognition for Gale’s return to his hometown and home track, and also educate media on the driver’s background and the road to NASCAR. FOX Sports picked up the pitch where Gale toured them around Mobile, Ala.—showing the crew everything from his first race shop to the parts store where he shopped, to Mobile International Speedway where he competed in his first racing events. As part of the tour, Gale also visited his alma mater, Baker High School, and spent time visiting old teachers and speaking with students about following their dreams.